$3.2 million grant from Maryland legislature may help Baltimore Symphony Orchestra settle contract dispute. Read more here. A new day for the Buffalo Philharmonic Orchestra, taking steps to refresh its image. Read more here. London’s Royal Opera House has lost its appeal over the life-changing hearing damage caused to a musician at a rehearsal of Wagner's Die Walkure. Read more here. “Dismiss the greatness of the CSO and we will be publicly embarrassed locally, nationally and globally. Respect the musicians and Chicago will be honored for its commitment to culture.” Jeff Rice, Senior Lecturer/Northwestern University. Read more here. Chicago Symphony Orchestra Association rejects latest offer from the CSO Musicians; strike to go on. Read more here. International Federation of Musicians (FIM) sent a formal protest letter to Jeff Alexander, President/CEO of the Chicago Symphony Orchestra Association, in support of the Musicians of the CSO. View the letter here. Chicago Symphony Orchestra Musicians reject management’s proposal; strike continues. Read more here. 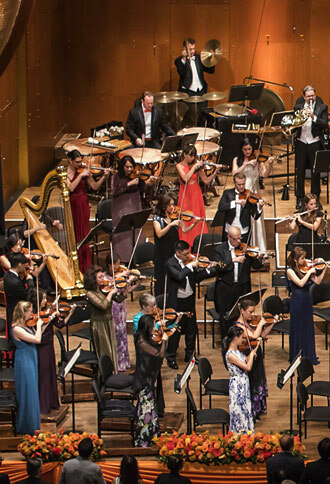 Musicians from ICSOM’s member orchestras have made donations in response to ICSOM’s Call to Action in support of the striking Musicians of the Chicago Symphony. Read our press statement here. Atlanta Symphony Orchestra announces their 2019-20 season, its 75th! Read more here. Executive profile of Mark Cantrell, the new President/CEO of The Florida Orchestra. Read more here. News from the Hawai'i Symphony's world premiere of Raise Hawaiki, a collaborative artistic interpretation of the Polynesian Voyaging Society’s Mālama Honua worldwide voyage. Read more here. The St Louis Symphony Orchestra celebrates its 50-year partnership with conductor Leonard Slatkin when the orchestra’s conductor laureate returns April 27-May 4. Read more here. San Antonio Symphony Music Director Sebastian Lang-Lessing will step down in 2020 and has issued a $100,000 challenge grant. Read more here. Utah Symphony And Utah Opera Commemorate 150th Anniversary Of Transcontinental Railroad. Read more here. Press Release (04/08/2019): ICSOM's Call to Action for the Musicians of the Chicago Symphony Orchestra. Read more here. ICSOM has issued a Call to Action for the Musicians of the Chicago Symphony Orchestra. Read more here. ICSOM Chairperson Meredith Snow (Los Angeles) re-elected to a two-year term of office at the 2018 Conference in Cincinnati OH. For the official press release, plus other election results, click here, or to read more on this website, click here. Bruce Ridge authors book on ICSOM. Read more here. COMPOSED: A documentary about performance anxiety and orchestra musicians. Read more here. The ICSOM Directory is now searchable online. Current and Emeritus members must sign in to access this service, which can be found under the REFERENCE tab, or click here. Register on the AFM-EPF website "Participant Portal" to access your Pension Fund information. For assistance call the Fund Office at 1-800-833-8065, x1295. Visit website.